Being a customer oriented organization, we are deeply engaged in offering a wide array of Mango Pickle Masala. We are well-known firm of the Aam Achar Masala. These products are broadly admired by customers owing to their longer shelf life and purity. Owing to high demand, we offer this product in varied packing options that meet on clients demand. Furthermore, we provide this product at low cost. 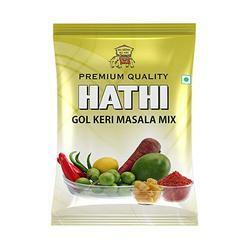 We manufacture high quality ready to use masala for making tasty and spicy mango pickle. We are engaged in offering a quality approved range of Achari Masala Powder. With our affluent industrial knowledge, we are betrothed in offering an extensive series of Aam Achar Masala. Apart from, we offer this product in diverse packing option at affordable prices. Ingredient: Red chilly, Salt , etc..
Owing to our years of industry experience and precise knowledge of this domain, we are offering an outstanding assortment of Mango Pickle Masala. A perfect blend of some pure spices, this is certainly the most detailed blend in the Mahalaxmi Collection. This blend is evenly balanced for taste and flavour and spreads a rare character to Pickle.